Carlsbad is a lovely beach town in Southern California. 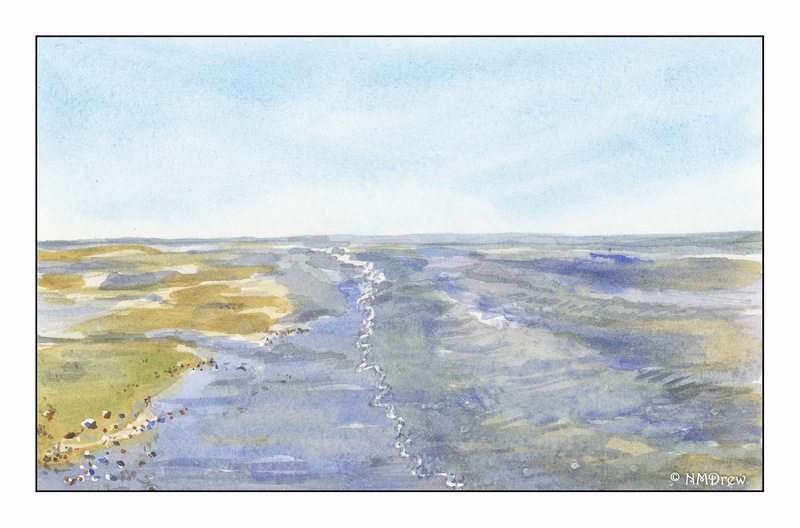 The beach is wide and flat; at low tide it stretches forever. Water is all you see to your left, to your right, and westward . . . The flat blue sky often blends into the ocean, making where one ends merge with where one begins. This morning I set out to do a couple of things. First was to do another ink / pen drawing. I used the same sketchbook as I did yesterday, one with lightweight paper that worked very well yesterday. 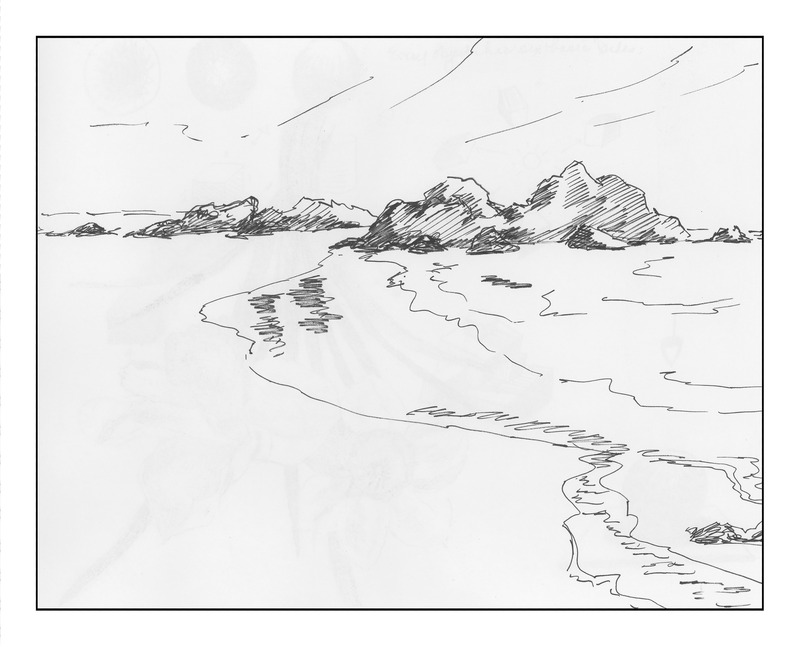 Second, the attempt to stretch myself a bit and do a beach scene. I find waves incredibly difficult. The sketch itself was okay – nothing particularly challenging in and of itself. I rather liked the composition. However, if you look at the sketch above, do you see those little greyish streaks in the lower left and center? That should have clued me in then and there – the paper is very thin. Water? What was I thinking of? And here we are, with washes applied with a lot of water. Even though you cannot see it, the paper became mottled in appearance, buckled and crumpled. Ugh! But, what the hell, I may as well try something. 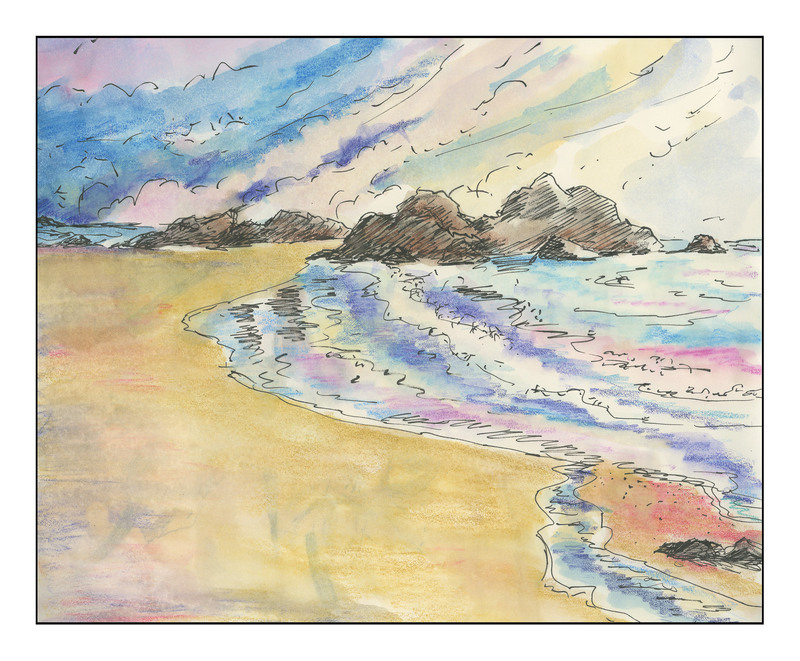 And thus, I picked up my box of Caran D’Arche’s Neocolor II crayons, and carried on . . .
Having never really used the Neocolor crayons before, I will say I liked them. 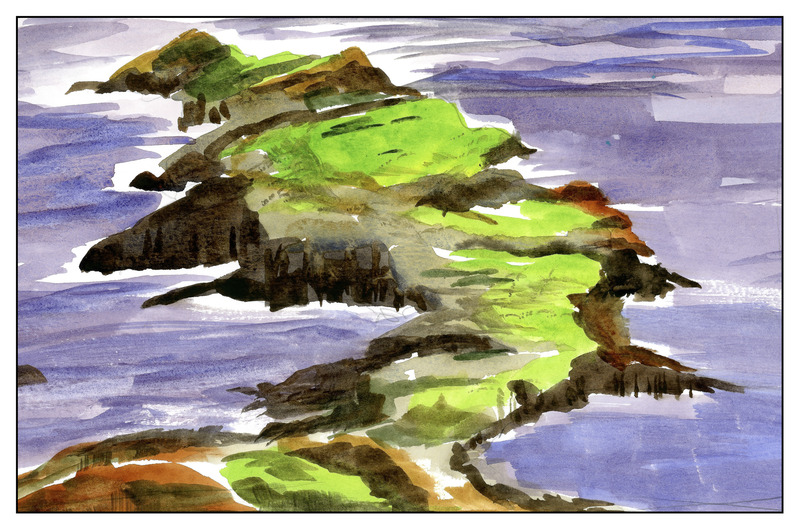 I scribbled in colors which I thought might work, and then laid other colors on top of them to blend before using water. 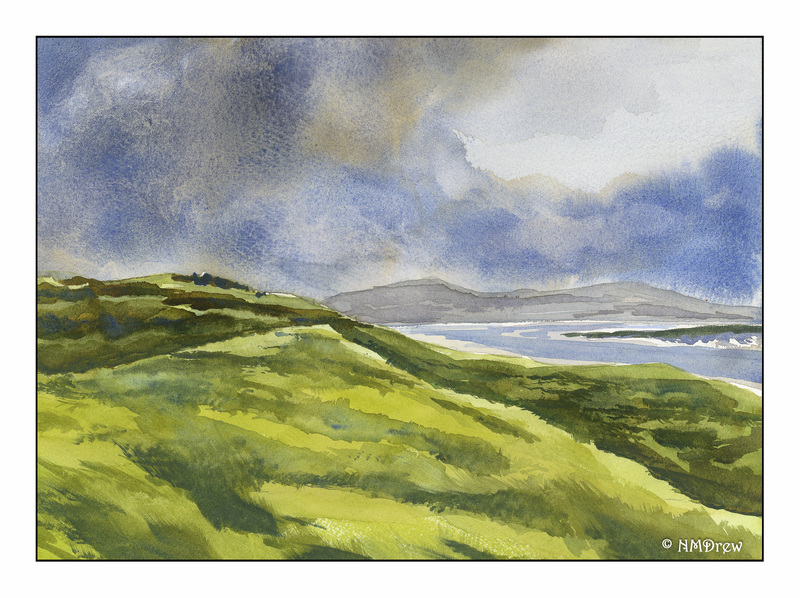 And then with a waterbrush – not a laden brush – I smoothed and shaded. I am not pleased with this picture at all, but I still learned something about a medium I haven’t really explored – the watercolor crayons. On a heavier paper designed to take water, there is a lot of potential here. 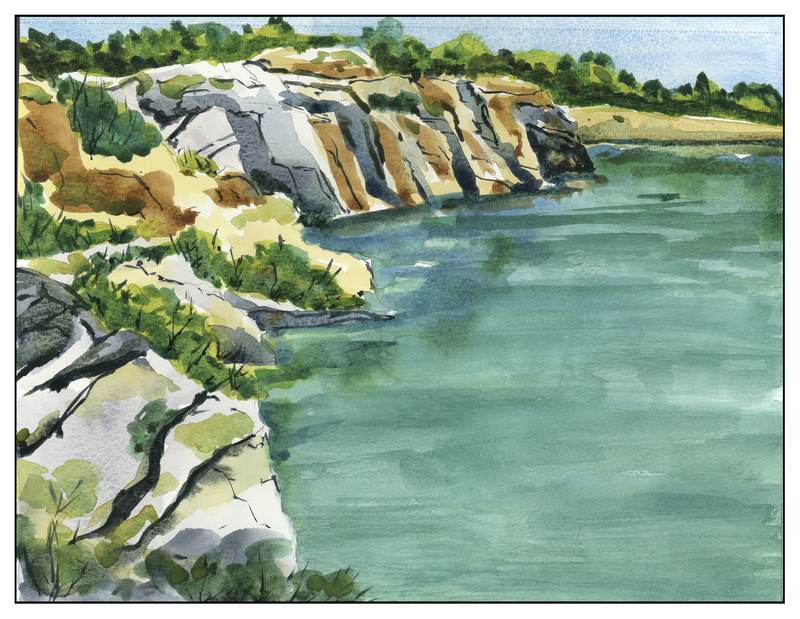 I love coloring, so I can see myself moving into this area, perhaps more so than with watercolor pencils, which seem more delicate to me in their color rendering, but perhaps that is wrong as I have limited experience with them as well. Oh, well. The picture was a disaster, but the potential far outweighs it. 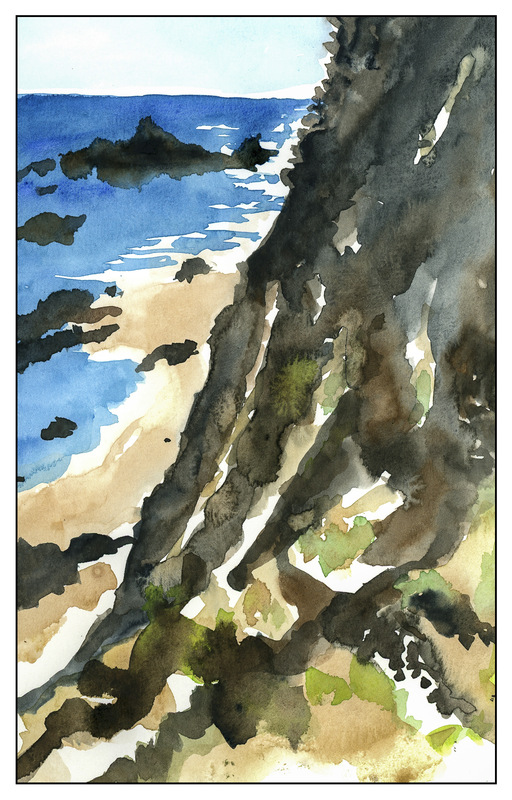 Another “direct watercolor” from a photo I took sometime ago when up along the bluffs in Carpinteria, CA. This one might be worth repeating just because there are some areas I really like about it, but the rocks to the left of the cliff are rather dismal. The topmost rock was really a boat on the horizon! 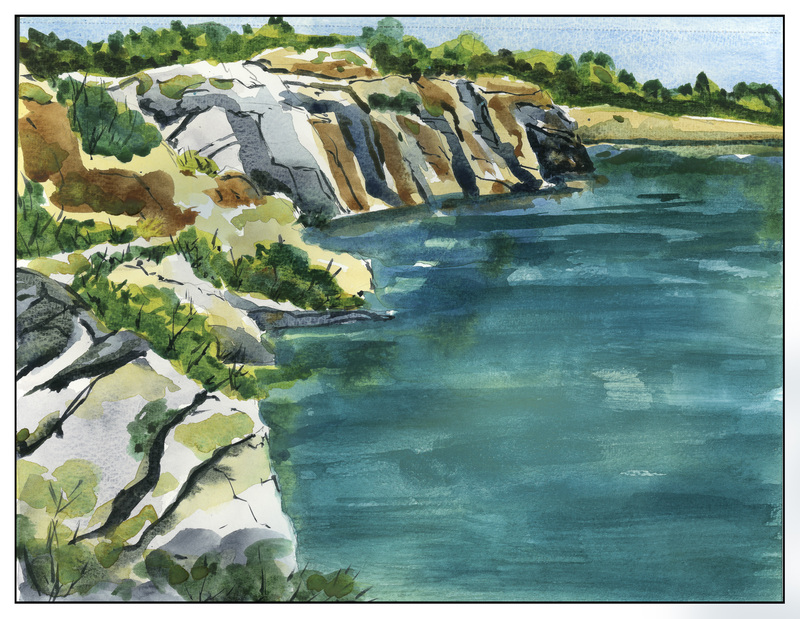 I painted the boat first, and then it just got bigger and bigger, to the point I morphed it into a dreary rock. 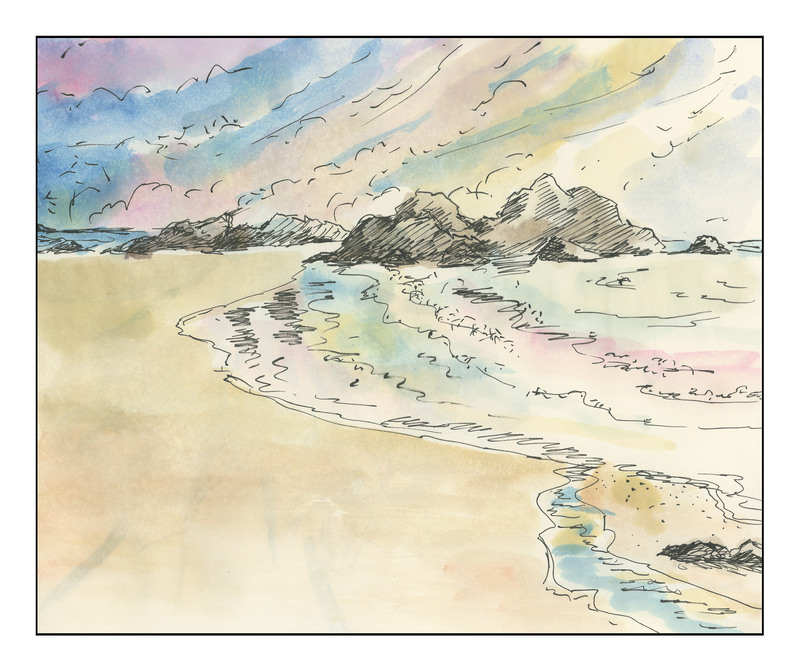 Those rocks need work, as does the color gradation of the sand on the beach. I like a lot of the colors, but overall the sparkle is missing from the photo. If at first you don’t succeed . . . ya know.